Do not engage in unauthorized employment. You cannot engage in any activity for which you receive renumeration for your activities in the United States. Do not remain in the U.S. beyond your authorized period of admission. Remaining in the U.S. beyond your authorized stay can result in the accrual of “unlawful” presence which may bar you from returning to the U.S. for a period of 3 or 10 years. While it is a bit more difficult for the USCIS to establish unlawful presence for Canadians who enter without a visa because they are typically not issued an I-94 with a specific expiration date (they are admitted for duration of status or D/S) the period of admission is generally accepted to be 6 months but there is currently some confusion on this point. Importantly, for purposes of determining when a Canadian national who enters without a visa and is not issued an I-94 becomes out of status and therefore begins accrual of unlawful presence requires some sort of action by the Department of Homeland Security to determine that the duration of status as a non-immigrant visitor has concluded. However, is it just wise for Canadians who enter without visas and who are not issued I-94’s to limit their stay in the U.S. to a period not exceeding 180 days. 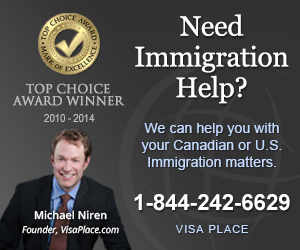 Do not abuse the visitors visa by using it as an end-run-around obtaining an immigrant visa. For example if you have a spouse or significant other in the U.S. and you are entering the U.S. on a non-immigrant visa and remaining in the U.S. for long periods of time, have a home or regular residence in the U.S. and are spending more time in the U.S. than in Canada the Customs and Border Patrol (CBP) officials may determine that you are using the visitors visa like a resident card and find that you are an intending immigrant and may deny you entry or in a worse case scenario my place you in expedited removal proceeding which have serious consequences.